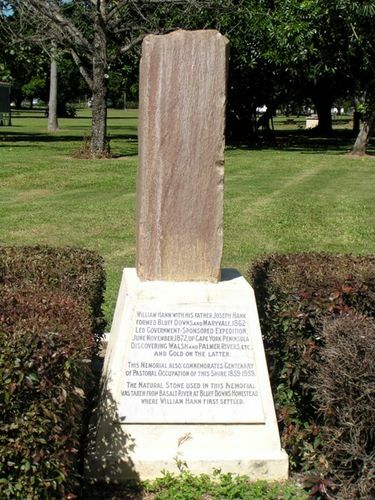 The memorial commemorates the centenary of pastoral settlement and Joseph and William Hann, who were early explorers and pastoralists in the Kennedy District. William Hann (1837-1889), and Frank Hugh Hann (1846-1921), explorers and pastoralists, were the sons of Joseph Hann and his wife Elizabeth, nee Sharpe. The family migrated from Wiltshire in 1851 to the Westernport district in Victoria. In 1862 Joseph Hann was attracted to the newly-opened upper Burdekin district in Queensland where in partnership with Richard Daintree and some Melbourne investors he took up Bluff Downs, Maryvale and Lolworth stations. After Joseph was drowned in the great Burdekin flood of January 1864, his sons struggled with hostile Aboriginals, speargrass, dingoes and falling wool prices and in 1870 William had to overland their last 19,000 sheep to Victoria; Lolworth and Bluff Downs were surrendered and he ran cattle at Maryvale. FORMED BLUFF DOWNS And MARYVALE, 1862. AND GOLD ON THE LATTER. OF PASTORAL OCCUPATION OF THIS SHIRE 1859-1959. WHERE WILLIAM HANN FIRST SETTLED.